OPS « Japan, Hockey, Baseball, etc. 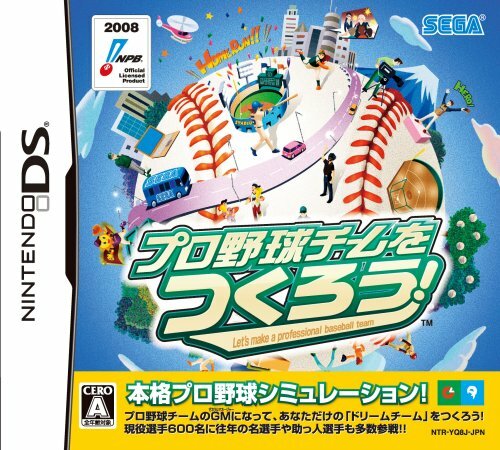 High school baseball’s regional qualifying tournaments for the annual Koshien tournament is well under way, but NPB is taking its usual day off on Monday, so let’s take a look. The ageless 40 year old wonder and world record holder for most consecutive innings played, Tomoaki Kanemoto of the Hanshin Tigers, is the NPB OPS leader. His career line sits at around .300/.400/.550 (in healthy seasons), so while his performance is amazing, it is not totally unexpected. He is one of the few players on the batting leaders board who is not on the the Team Japan preliminary roster of 39 players, so his presence on the Tigers during the Olympics will be important in keeping the team’s big lead over its CL opponents. Norichika Aoki of the Tokyo Yakult Swallows makes an appearance on the leader board after missing some time with injury, he’s been on a tear lately and have continued to display his developing power with .578 SLG even in the expanded Jingu Stadium outfield. With his current hot back Aoki has pretty much cemented his place as the starting CF on Team Japan at Beijing. He will be hugely missed by the young and vulnerable Swallows during the Olympics though. Yokohama BayStars Seiichi Uchikawa’s breakthough season seems to be the real thing as he’s played in 70 games already and keeps on sticking around the leaderboard. He’s a career .290/.330/.420 hitter though with consistent AVG and OBP while seeing some fluctutations in SLG (.363 – .515), so either he’s altered his swing mechanics or approach at the plate to see some drastic results, or this is quite a fluke season. When I run across some interview with him I guess I’ll know. Toshiya Sugiuchi of the Fukuoka SoftBank Hawks continues to dominate NPB in FIP but just isn’t getting the run support, luck, and defense to rack up the wins like his fellow leaders Iwakuma (Eagles), Lewis (Carp), and Darvish (Fighters). Sugiuchi’s K/BB sits at an astonishing 7.21 (Yup, that’s a 7 there in the first digit!) He’s cranked up his K rate to above 9 (his pre-2005 level) and simultaneously cut down on the number of walks issued. Of the rest of the leaderboard, only Iwata, Kawakami, and Naruse are Olympic hopefuls while Utsumi, Komatsu, Greisinger, and Shimizu will be staying on the archipelago to give their clubs an edge during the Olympic month. 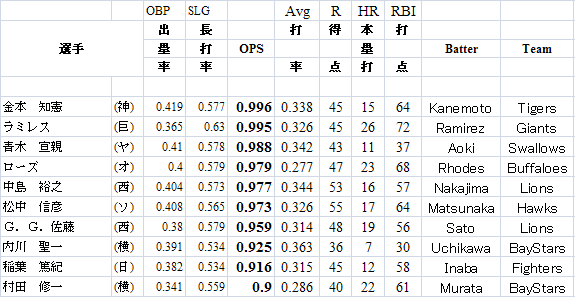 Just a quick run down on pitching and batting leaders in NPB as of 5/12 after the slew of Golden Week holidays games. Yes, I know that both metrics are far from perfect, but since there’s no information like this out there right now for NPB, I thought I’d provide one (hopefully periodically). I used the constant of 3 for FIP because NPB is a low power, small ball, low scoring league. No surprises that some Giants like Greisinger and Utsumi show up as being underrated when you compare their FIP to ERA, the team doesn’t value defense. And there are no surprises on the OPS side, either they’re proven sluggers or hitters who have started off the year hot. Yamasaki is an interesting case, he may just be continuing his hot streak which lasted all of last year, or maybe proving that he turned a corner in his age 38 season last year when he suddenly regained his form from 10 years ago when he battled Hideki Matsui for the homerun title when he was a Dragon. He won the homerun title last season, and is currently leading the league in AVG and OPS. Bocachica hasn’t reached the number of plate appearances to qualify, but he’s doing great at .950 OPS. 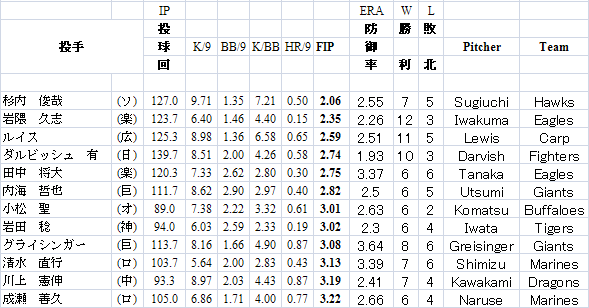 And despite his major slump the last few weeks, Guiel is still 24th in NPB in OPS at .801.